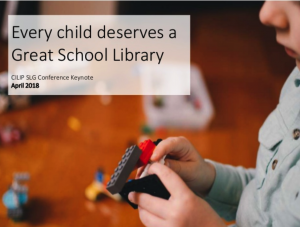 #GreatSchoolLibraries – a great campaign! With my other ‘hat’ on, Chair of CILIP School Libraries Group, I am really proud to tell you about the new campaign backed by CILIP that was launched at our 2018 Conference. The Great School Libraries campaign was launched by CEO Nick Poole in his opening speech. 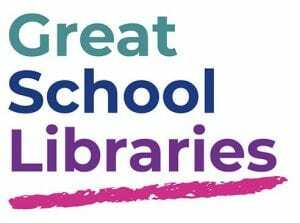 Working closely together with the SLA – School Librarians Association – CILIP, CILIPSLG and SLA are campaigning for the end of the closures of school libraries all over the UK. Not only that but we would like to go further and we are stating that every secondary school should have a professionally staffed, fully funded library. Please follow the link to register your support for this campaign, and to watch the presentation to see how we hope to achieve this together. The School Library Association’s most prestigious Award, honouring the best school librarian that year, from a very highly qualified shortlist, is Lucas Maxwell from Glenthorn Hight School in Sutton. The two other school librarians on the Honour List are: Mairéad Duggan – Mount Carmel Secondary School, Dublin and Shelagh Toonen – Elgin Academy, Moray All bring a passion and enthusiasm to their work that is thoroughly deserving of recognition by this award. To read the profiles of all the librarians on the Honour List visit the SLA website at: www.sla.org.uk The work of all the librarians on the Honour List, including the overall winner of School Librarian of the Year 2017, was celebrated at a ceremony held on Monday 9th October 2017 at The Hive, Worcester. 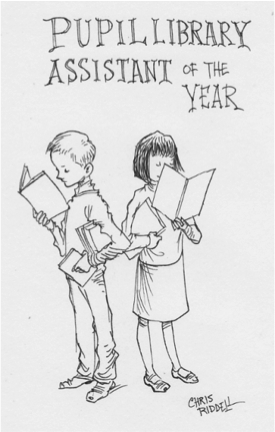 The Pupil Library Assistant of the Year Award is a joint venture between the School Library Association and the CILIP School Libraries Group. As well as promoting the work and achievements of pupils within their school libraries, work which involves dedication and commitment but which often goes unnoticed and unrewarded, it also highlights the benefits and values of the school librarian. Do you have a pupil librarian who could become the Pupil Librarian of the Year 2017? Someone who is reliable, volunteers regularly and who has made a difference to the library, being a role model for others? Someone who is an example of the synergy between a school library and the pupils? The award is supported by a number of leading children’s books publishers and the company, Authors Aloud UK, and judged by a panel of leading figures from the children’s book world and school library community.